Heat non stick skillet on medium high heat. In a small bowl, beat egg and cream together. Transfer egg mixture to pan and cook for approximately 3 minutes. 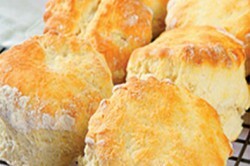 Remove and place on the side. Place another non-stick skillet over medium heat; melt butter. Lay the tortilla down flat in the skillet and then layer half of cheese down first, all of the egg, bean, corn, and rest of the cheese on top. 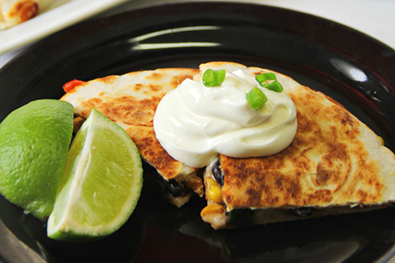 Once cheese starts to melt, fold tortilla in half. Serve with salsa verde. Add sour cream and cilantro for garnish if desired. 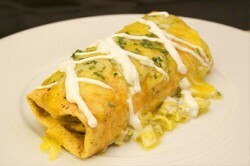 Garnish with sour cream and cilantro, and serve this Breakfast Burrito with salsa verde on the side. 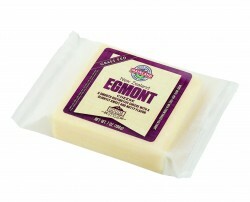 Serve these Egmont Cheese Scones warm with butter, perfect for the family or entertaining guests. 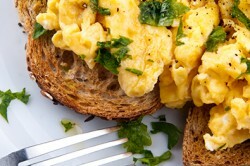 Fluffy, light scrambled eggs using Mainland Organic Cheddar Cheese.